Every year on April 22, over a billion people in 190 countries take action for Earth Day. From San Francisco to San Juan, Beijing to Brussels, Moscow to Marrakesh, people plant trees, clean up their communities, contact their elected officials, and more, all on behalf of the environment. The goal: 1-Billion Acts of Green. Green programs that honor Earth Day, and our environment go much deeper and wider than a single day of the year. In architecture and construction, we have certification programs to ensure buildings are not only Earth-friendly, but promote the general well-being of the people in them. Acoustics, mechanical noise control, and noise isolation are all part of those standards. The two most-used standards are LEED and Green Globes. Green Globes is a green building rating and certification system primarily used in Canada and the USA. Green Globes was developed by ECD (Energy and Environment Canada), a division of JLL (Jones Lang LaSalle). Green Globes provides certification for New Construction and Significant Renovations, Commercial Interiors, and Existing Buildings, including offices, multi-family residential, retail, healthcare, and light industrial facilities. The certifications are awarded by a point system, and run from Certified, to Silver, Gold, and the highest level – Platinum. LEED version 4 (v4) provides for interior acoustics, limiting the amount of background noise (typically mechanical noise), improving sound isolation, addressing reverberation time, as well as references for sound reinforcement and sound masking. These are a prerequisite for K-12 Schools, and are also referenced in the 2014 FGI Guidelines for Healthcare facilities. The benefits of following the LEED standards go far beyond certification. Designing school classrooms with acoustics in mind means that students are able to better hear their teachers, improving their learning ability and success. Studies have shown that better acoustical environments result in better student test scores. Healthcare facilities with well-implemented acoustics provide a more restful environment for healing and can positively impact patient satisfaction. Meeting the LEED acoustics criteria sometimes comes with a bit of reluctance, from an ecological perspective, due to the additional materials needed to provide for the acoustical treatments. Never fear! Say “Hello!” to a wheelbarrow full of “Green” materials! Many wall and ceiling products are produced with green practices in mind. They can be made from recycled content or use binders and fabrics with low VOC (Volatile Organic Compounds) emitting materials. There are even panels that filter the air. It all ads up to improving indoor environmental quality (EQ). Improving the quality of the environment, along with the ecological profile in your spaces, is what Acoustics By Design considers when it comes to responsible and sustainable design. Acoustics By Design employs three LEED Certified acoustical consultants and we have consulted on a long list of LEED certified projects. 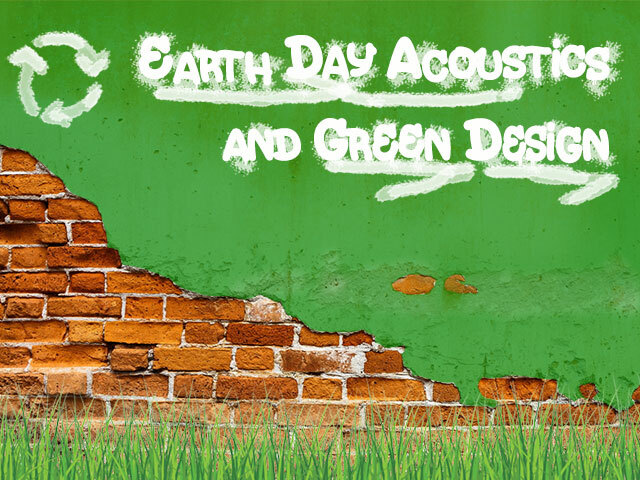 Hiring Acoustics By Design to help you with your LEED for Schools, LEED for Healthcare, Green Globes, or other environmentally conscious projects ensures that you’ll not only meet the requirements, but get space that’s better for the people in it.